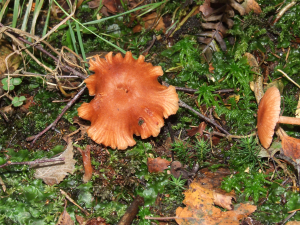 Observation - Hygrocybe sp. - UK and Ireland. Description: Cinnamon orange cap, paler gills and stipe. Cap radially fibrillose / lined, waxy, convex, 40-60mm. Cap margins increasing wavy with age with depressed centre. Habitat: leaf litter and moss in mixed wood. Occurance: small troop. Cinnamon orange cap, paler gills and stipe. Cap radially fibrillose / lined, waxy, convex, 40-60mm. Cap margins increasing wavy with age with depressed centre. Habitat: leaf litter and moss in mixed wood. Occurance: small troop.